October is National Seafood Month! 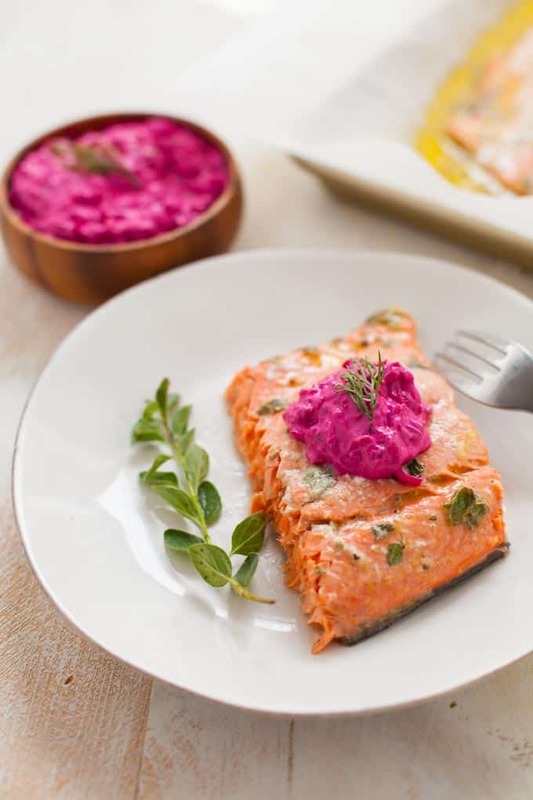 Celebrate the delicious and nutritious benefits of eating seafood, starting with my Greek marinated salmon topped with beet tzatziki. This post was sponsored by the National Fisheries Institute. Thanks for supporting the brands that make TFD possible! As always, all opinions are my own. I remember the day I decided to become a pescetarian well, despite being only 12 years old. I had already declared my protest of meat and poultry to my parents but the topic of seafood had not been discussed, or frankly, even considered yet. I didn’t realize that when I announced I was going to be a vegetarian that this would mean giving up my beloved seafood. Until….New England Clam Chowder. Back in my childhood and pre-teen years, clam chowder was my favorite food. I grew up vacationing in the summer with my family on the Cape and in Boston and this is where my love of chowdah flourished (how serendipitous that I would end up moving to New England six years later and staying for 11 years and counting). In fact, one summer, I made up my own chowder competition where I would order clam chowder at every restaurant we went to on the Cape and declare my favorite at the end of the vacation (yes, I was the one and only judge). So it only makes sense that one afternoon when my Mom and I went out to lunch and I saw clam chowder on the menu that I freaked. “Mom, does being a vegetarian mean I can’t have seafood anymore?!? 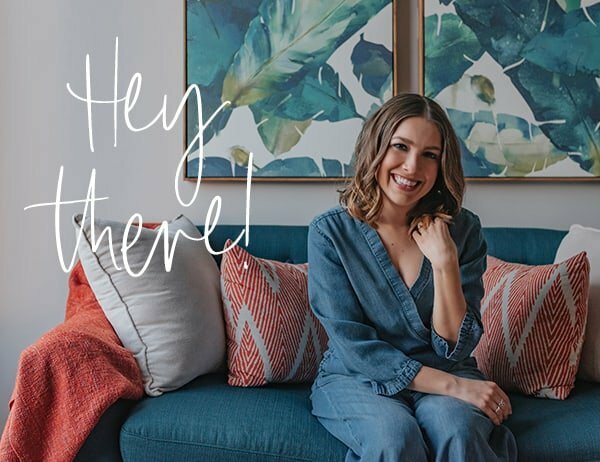 !” My Mom, who was already skeptical about my decision to go veg, saw this as a golden opportunity to encourage another source of protein and nutrients in my carbohydrate-heavy (pop-tarts and bagels) diet. “No, honey. Of course you can still have seafood. You love clam chowder so much, you shouldn’t have to give that up.” PHEW. And so a pescetarian I became. Now, as a registered dietitian nutritionist, I’m so happy that seafood is a part of my diet. The 2015-2020 Dietary Guidelines for Americans recommend at least two servings (eight ounces) of seafood per week because of its nutritional profile and health benefits. Not only is seafood a good source of protein, it also contains the most B12, vitamin D and omega-3 fatty acids (EPA and DHA) out of all animal protein foods. Eating two servings of fish per week, which provides about 250mg per day of EPA and DHA, is associated with reduced mortality related to heart disease. Other studies show evidence that eating patterns which include seafood are associated with reduced risk of cardiovascular disease and obesity. Plus, the benefits continue for women who are pregnant or breastfeeding! Improved infant health outcomes are associated with pregnant or breastfeeding women who consume at least two servings of seafood per week. 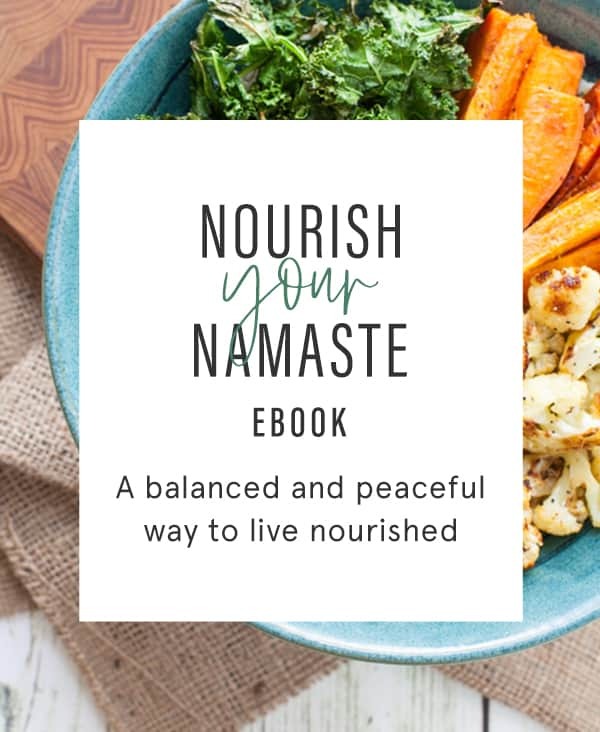 Whenever, I tout the benefits of eating fish to my clients, I’m always hit with the follow-up question: “yeah, but what about mercury?”, so let’s address the elephant in the room. Mercury is a heavy metal that’s found in different species of seafood at different levels. Some species of seafood have low levels of mercury; others have high levels. If you’re regularly consuming more than two servings of fish per week, you’ll want to make sure you’re choosing a variety of seafood that includes choices low in mercury. And if you’re preggers or breastfeeding, you should avoid varieties of seafood that are high in mercury. 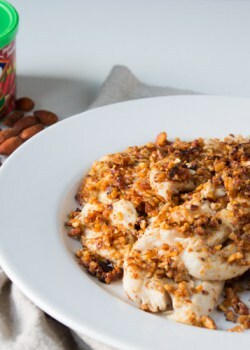 Given my passion for seafood as part of a healthy (and delicious!) eating pattern, I’m excited to be partnering with Dish on Fish for National Seafood Month in October! Dish on Fish, launched earlier this year, is an initiative geared towards educating the public about the importance of eating seafood at least 2-3 times per week. 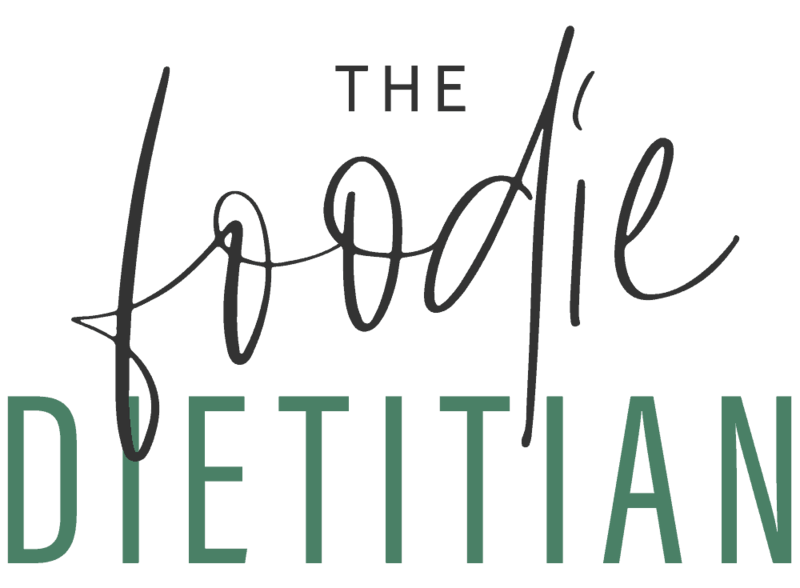 It’s a pretty robust educational blog, complete with recipes, monthly meal plans and the 411 on seafood nutrition. In a medium bowl, whisk together lemon juice, olive oil, oregano, garlic, mustard, salt and pepper until combined. 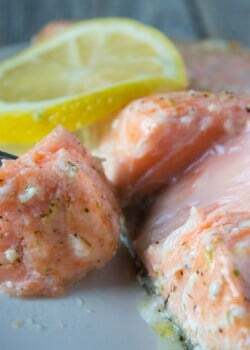 Place salmon inside a gallon-sized ziplock bag and pour marinade over top. 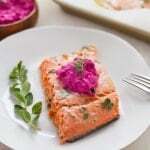 Make sure salmon is fully coated with marinade and let sit for 30 minutes in the refrigerator. 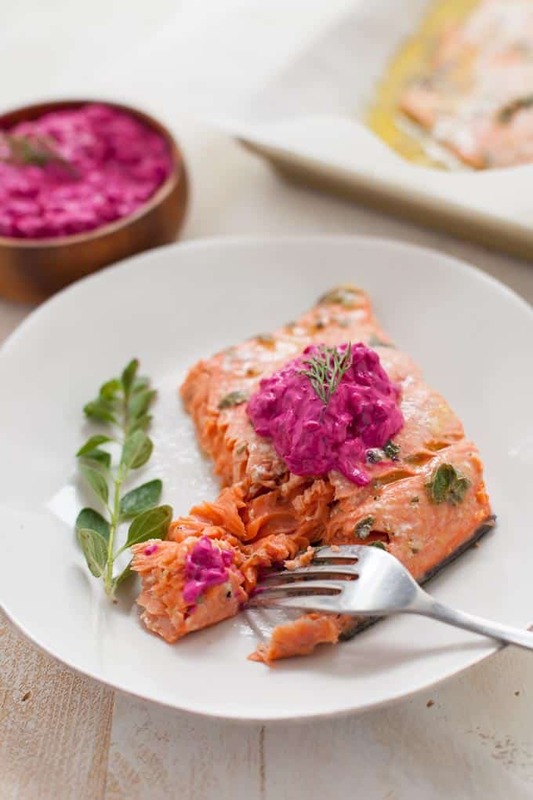 Remove salmon from marinade, place on parchment-lined baking sheet and discard excess marinade. 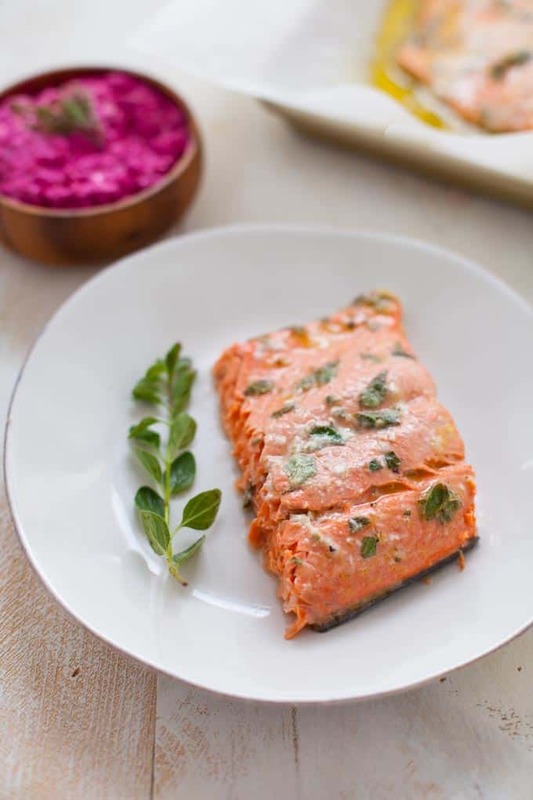 Bake salmon for 20-25 minutes at 350 degrees F, or until salmon is slightly opaque in the middle and flakes easily. Optional: Top with beet tzatziki. Tell me, what’s your favorite type of seafood? For more seafood inspiration, check out my recipes below! Yum! I’m always looking for ways to jazz up my salmon. Love the tzatziki! Thanks, Jamie! Tzatziki makes everything taste better, IMO. 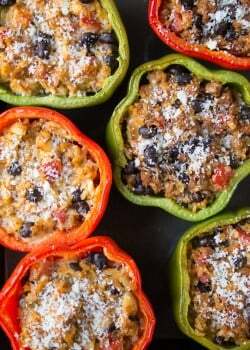 Loving everything about this recipe! It looks amazing!! This is such a pretty dish!